Iceland is a country known for its natural wonders: glaciers, active volcanoes, black-sand beaches, geothermal areas, roaring rivers, majestic waterfalls, and beautiful lakes. 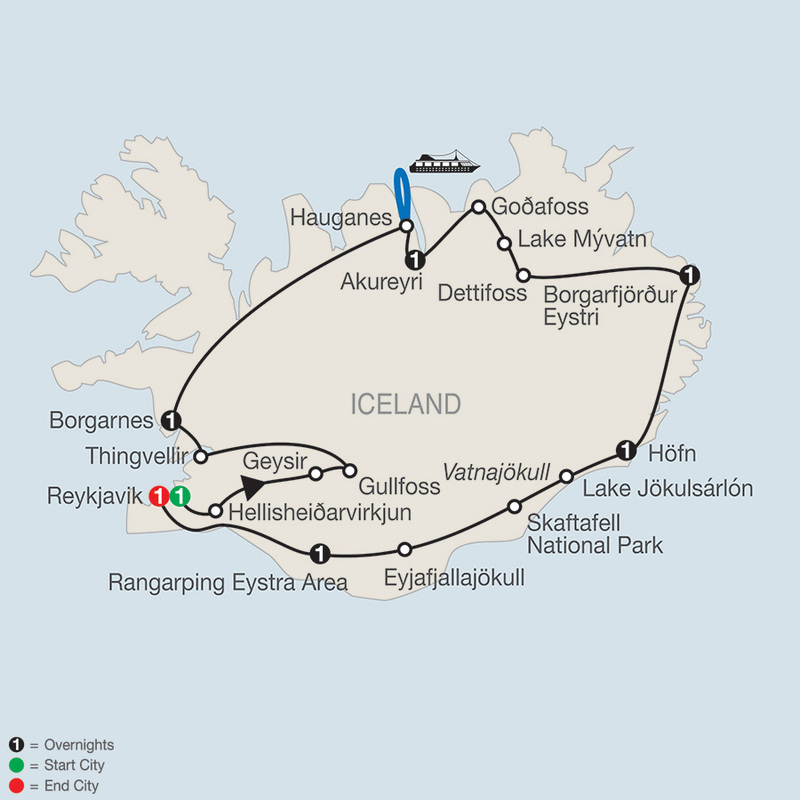 On this Iceland tour, you will start and end in Reykjavik, and you'll witness these natural wonders while enjoying fun and unique experiences. Certain features are subject to nature's law. After an orientation drive of cosmopolitan Reykjavik, enjoy an interesting visit to the geothermal heat and electric POWER STATION in Hellisheiðarvirkjun. Next, see the hot springs at the Geysir geothermal area and look forward to meeting the chef of the Geysir restaurant. Taste freshly baked bread, which is cooked using the heat from the hot springs, with Icelandic butter, boiled eggs and herring, and a glass of Geysir schnapps, served at freezing point. Then, marvel at the mighty Gullfoss waterfall and stop in Thingvellir, a geological paradise. Here, you will walk through the rift valley that marks the separation between the North American and European tectonic plates. A real treat! At Hauganes, embark for an unforgettable experience: watch whales in their natural habitat! Continue to Akureyri for your overnight stay. During your orientation of the capital of northern Iceland, hear about the city’s history after it was established as a trading center in 1602. Visit the BOTANICAL GARDEN, featuring specimens of almost all native Icelandic plants. Then, admire Goðafoss, known as the “Waterfall of the Gods.” Enjoy a scenic drive to the lovely blue Lake Mývatn, teeming with bird life in one of Iceland’s prettiest areas, and stop at the Mývatn Nature Baths, a set of geothermally heated pools and steam baths. Before arriving in Borgarfjörður Eystri, take pictures of the most powerful waterfall in Europe, Dettifoss (road conditions permitting). You may even see puffins, known as the “clown of the sea” (end of April to mid-August). In the morning, enjoy a “Meet the Locals” walking tour and hear about life in the rural Icelandic countryside over the centuries. Follow the eastern coast, where the first Irish missionaries settled some 200 years ago, and arrive in Höfn. Prepare for the highlight of the day: stop at Lake Jökulsárlón, where some of the most spectacular scenes of the James Bond movie Die Another Day were filmed. Watch how the largest glacier in Europe, Vatnajökull, flows into the lake, forming icebergs. An exciting optional boat trip is available through the icebergs (mid-May to September, weather permitting). Drive through the national park at Skaftafell and arrive at your overnight hotel. Along the South shore enjoy views of the Eyjafjallajökull volcano, well known for the eruption that generated the massive ash cloud in 2010, then stop at spectacular Seljalandsfoss waterfall before returning to Reykjavik. This afternoon, join an optional excursion to the Blue Lagoon. Tonight, a farewell dinner awaits at one of Reykjavik’s fine restaurants to celebrate your Icelandic Adventure. Enjoy a peaceful time at the Blue Lagoon, an incredible geothermal spa set in an otherworldly area where lava and thermal waters complement each other.